"And Nathan said to David, Thou art the man. 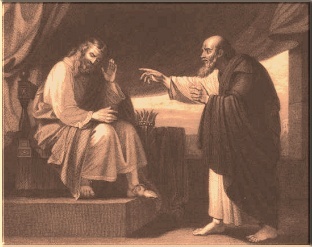 Thus saith the LORD God of Israel, I anointed thee king over Israel, and I delivered thee out of the hand of Saul; And I gave thee thy master's house, and thy master's wives into thy bosom, and gave thee the house of Israel and of Judah; and if that had been too little, I would moreover have given unto thee such and such things." The books of reference used for this study of the book of 2nd Samuel were the Bible, King James Version, called "The Companion Bible", Publisher Kregel; Strong's Exhaustive Concordance of the Bible, numbered to the Hebrew, Chaldee, and Greek, and English, coded to the Strong's Concordance numbers. "Report of the Battle, Saul Dead [1-16]." "The Lamentation of "The Bow" [17-27]." Chapter 2 "The Kingdom Divided." "Military Conflict with in Israel [12-32]." "The War Between the Two Houses [1-5]." "House (nation) of Saul [6-11]." Chapter 4 "Personal Conflicts ." Chapter 8 "David's Mighty Acts [1-14]." Chapter 10 "David's Kindness to Hanun [1-5]"
"First and Second Wars [6-19]." Chapter 11 "David's Sin [1-5]." Chapter 12 "David and Nathan the Prophet." Chapter 13 "David's Sin. Punished." "Amnon's Sin, Desire for his Sister [1-4]." "Parable, of Woman and King [4-11]." "David's Recall of Absalom [12-33]." Chapter 15 "Absalom's Rebellion, Treason (Secret) [1-6]." "Absalom's Departure to Hebron [7-9]." "Absalom's Open Treason Against David [10-13]." Chapter 16 "Refreshments Brought [1-2]." "Absalom's Entry into Jerusalem [15-23]." Chapter 17 "Ahithophel's Counsel to Absalom [1-5]." Chapter 18 "The Battle Fought [1-8]." Chapter 19 "Sorrow of David Restrained [1-8]." "David's Re-entry into Jerusalem [31-43]." Chapter 22 "Worship, Song of David." The Tempest, Overthrow of Enemies [8-16]." "Overthrow of Enemies, Arms [29-51]." Chapter 23 "The Last Words of David." Chapter 24 "David's Sin in Numbering [1-10]." "Expiation of the Sin [16-25]."